Osho (December 11, 1931 – January 19, 1990), also known as Acharya Rajneesh or Bhagwan Shree Rajneesh, was one of the greatest spiritual leader and teacher of the 20th century. 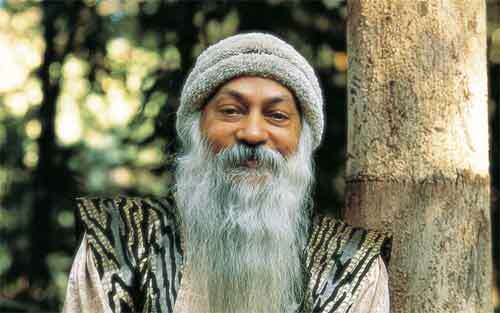 Osho thoughts are mostly from books, magazines, newspapers and videos. These collections of 108 thoughts are based on Osho’s views and teachings and have been collected over a period of 12 years. Laughter relaxes. And relaxation is spiritual. Laughter brings you to the earth, brings you down from your stupid ideas of being holier-than-thou. Laughter brings you to reality as it is. The world is a play of God, a cosmic joke. And unless you understand it as a cosmic joke you will never be able to understand the ultimate mystery. I am all for jokes, I am all for laughter. Look at the trees, look at the birds, look at the clouds, look at the stars...and if you have eyes you will be able to see that the whole existence is joyful. Everything is simply happy. Trees are happy for no reason; they are not going to become prime ministers or presidents and they are not going to become rich and they will never have any bank balance. Look at the flowers - for no reason. It is simply unbelievable how happy flowers are. You go on accumulating energy. The more you accumulate, the higher it rises. Just like in a dam. But if there is a leakage, the water level will not rise. Your sexuality is a leakage of your being. Relax and drop all that is unnatural in you – all pretensions, pseudo coverings, masks. Be just ordinary. To be ordinary is the greatest thing in the world. Somewhere deep down in man there is fear of nature. That fear of a nature has created many problems. It has created an ugly civilization, an anti-nature technology, a science against ecology, a religion which is not in tune with your innermost being. But why is man afraid of nature? The reason is that nature is bigger than your ego, and if nature is allowed, the ego cannot be in control. The nature will control you. I don't think about the future at all, it is irrelevant. My whole effort is how to beautify this present moment, how to make people more celebrating, how to make people more joyous, how to give them a little glimpse of blissfulness, how to bring laughter to their life." Your mind has been corrupted by universities, colleges, education, society, economists, theologians etc. They have made it a conditioning deep down within you, that unless something has a purpose deep down within you it is useless – so everything must have a purpose. A child playing has no purpose. Collecting flowers, I enjoy, it is ecstatic – but there is no purpose. To be alive is enough, there no need for any purpose. Upanishad says ‘Live Richly.’ Western philosophy says ‘Die a rich man.’ If you want to live richly, you have to live here and now; not a single moment is to be lost. If you want to achieve something, you will die a rich man. But you will live a poor man; your life will be poor. True celebration should come from your life, in your life. And true celebration cannot be according to the calendar, that on the first of November you will celebrate. Strange, the whole year you are miserable and on the first of November suddenly you come out of misery, dancing? Either the misery was false or the first of November is false; both cannot be true. And once the first of November is gone you are back in your dark hole, everybody in his misery, everybody in his anxiety. Life should be a continuous celebration, a festival of lights the whole year around. Only then can you grow up, can you blossom. Transform small things into celebration. Try to find that which is absolutely destined. That is your nature, that is your essence. But you are lost in accidents. You pay too much attention to accidents; you are too worried about them. Your whole time and energy is wasted in them. You become so much occupied with the nonessential that the essential is forgotten. Look at that which is your innermost core, which is you. That innermost core is absolutely destined. Outside, nothing is destined. Inside, everything is destined. People who live with nature are more trustworthy. Science has succeeded so much, and it has done miracles – useless miracles of course, because they have not added a single bit to human happiness, and a miracle is useless If happiness has not increased through it. Rather, happiness has decreased. More technology, the more comfort, but the less happiness: this is the miracle that science has done. The more things can be done by mechanical devices, the less you are needed. And the less you are needed, the more you feel futile, useless and meaningless. Happiness comes out of being needed. By enjoying and doing whatever you do as a gift of existence, you can let your creativity bloom. Creativity is the quality that you bring to the activity you are doing. It is an attitude, an inner approach – how you look at things. Whatever you do, if you do it joyfully, if you do it lovingly, if your act of doing it is not purely economical, then it is creative. If you have something growing out of it within you, if it gives you growth, it is spiritual, it is creative, it is divine. Love what you do. Be meditative while you are doing it – whatsoever it is! Life’s aim is life itself more life, deeper life, higher life, but life always. There is nothing higher than life. And a reverence for life is a necessary corollary. If life’s aim is life, then reverence for life becomes your religion. The world does not need any organized religion. The world certainly needs religious people individuals in search of deeper and richer life. And as life becomes infinitely deep, it is the paradise; you have entered the kingdom of God. And the doors are within your own heart. Don’t choose. Accept life as it is in its totality. Always remember to judge everything by your inner feeling of bliss. Happiness happens when you fit with your life, when you fit so harmoniously that whatsoever you are doing is your joy. Possessiveness is nourishment for the ego. Transcendence means going beyond duality. Attachment means remaining within duality. When one remembers one’s sacredness, one’s infinity, joy wells up. When one thinks oneself limited by a thousand and one limitations, misery arises, because a limitation is a kind of confinement; it is a prison. Power is dangerous without meditation. Any kind of power is bound to become destructive if there is no meditation involved in it. Once you have started seeing the beauty of life, ugliness starts disappearing. If you start looking at life with joy, sadness starts disa­ppe­aring. You cannot have heaven and hell together, you can have only one. It is your choice. I teach love for the world. Love this earth — it is really beautiful… It is utter splendor. Love from the smallest, the dewdrop, to the greatest star. Let this whole existence be your love object, let it be your beloved. Love has to be all-inclusive. And then only will you know the second thing, then only is the second possible — gratitude. Because when one is in love with existence one feels such blessing, such bliss, that it is natural to bow down in deep gratitude, and when gratitude arises, prayer has arrived. Change happens when you start dropping the conflict with existence. That is the only meaning of all the great religions when they emphasize, 'drop the ego.' They are saying drop the conflict. The ego is nothing but all the tensions that you have created around yourself. And in the first place there is no need to create it. To grow real roses is difficult, you can purchase plastic roses. They will not deceive you, but they will deceive the neighbors – that is the point of the ego. It is very difficult, particularly for the western mind, to understand that life is purposeless. And it is beautiful that it is purposeless. If it is purposeful then the whole thing become absurd – then who will decide the purpose? Then some God has to be conceived who decides the purpose, and then human beings become just puppets, then no freedom is possible. And if there is some purpose then life becomes businesslike; it cannot be ecstatic. The West has been thinking in terms of purpose, but the East has been thinking in terms of purposelessness. The East says life is not a business, it is a play. And a play has no purpose really; it is non-purposeful. Or, you can say play is its own purpose; to play is enough. Life is not reaching towards some goal; life itself is the goal. It is not evolving towards some ultimate; this very moment, here and now, life is ultimate, life as it is accepted in the East. The East says God is not the creator, God is the creation. Nobody has created it; it is there. It has been so always, it will be so always – sometimes manifest, sometimes unmanifest; sometimes visible sometime invisible. It goes on moving in a periodical rhythm, in a circle. But existence itself is uncreated and it has no goal. You have to be living naturally this moment. The next moment will come out of it on its own. Just as a child grows and becomes a youth – there is no need to plan for it, one simply becomes; it is natural, it happens. As a river flows and comes to the ocean – the same way – you flow and you come to the end, to the ocean. But one should remain natural, floating and in the moment. Once you start thinking about the future and ambition and desire, you are missing this moment. When you think of the future it is nothing but the projection of the past; when you think of the past it is nothing but trying to plan for the future – they are together. Listen to your being. It is continuously giving you hints; it is a still, small voice. It does not shout at you, that is true. And if you are a little silent you will start feeling your way. Be the person you are. Never try to be another, and you will become mature. Maturity is accepting the responsibility of being oneself, whatever the cost. Risking all to be oneself, that’s what maturity is all about. Maturity is a rebirth, a spiritual birth. You are born anew, you are a child again. With fresh eyes you start looking at existence. With love in the heart you approach life. With silence and innocence you penetrate your own innermost core. The witness, the observer, divides the world into subject and object, into the witness and the witnessed. Therefore as long as there is a witness, duality will continue. Witnessing is the last frontier of the dual world, after which the non-dual begins. But one cannot reach the non-dual without being a witness. To be a witness means that I now give up dividing the world into many. Instead I will divide it two- the witness and the witnessed. And when I have reduced the many fragments of the world to two, it will not be difficult to come to the complete unity of existence when duality will disappear, when the observer and the observed will become one and the same. If one succeeds in becoming a witness he will soon have glimpses of the one without the other, when there is neither witness nor witnessed, but only witnessing. Drop your desires to know the real meaning of life. Whatsoever meaning we give to life, we give it to life. If you want to know the real meaning of life, then you have to drop giving all meanings to it. Your desires are giving meanings to life and they are attempting to define the indefinable. And if you remain clouded with your desires, whatsoever you know is nothing but your own dreaming. That is why we say that this life, this so – called life lived through desires, is maya, it is a magical thing. You create it, you are the magician. It is your maya, your magic. Advaita means literally non-duality, not two. They could have said one, but the Upanishads never use the word ‘one.’ They say non-duality not two. And this is very significant, because if you say one, the two is implied, it becomes a positive statement. If you say there is only one, You are asserting something positive. The moment you say one, the two is implied, because one can exist only by the side of two. So Upanishads, never say that the Brahman is one, the truth is one. Rather they use a negative term; they say he is not two. So one is implied, but not directly asserted. Secondly, about the total we cannot assert anything positive, we cannot say what it is. At the most we can say what it is not, we can negate. We cannot say directly, because once we say something directly, it becomes defining, it becomes a limitation. When you simply say it is not two there is no boundary – the implication is infinite. You cannot point to the Brahman with a finger, because your finger will become a limitation. Then Brahman will be where your finger is pointing and nowhere else. Intuition is like instinct because you cannot do anything about it. It is part of your consciousness, just as instinct is part of your body. You cannot do anything about your instinct and you cannot do anything about your intuition. But just as you can allow your instincts to be fulfilled, you can allow and give total freedom to your intuition to be fulfilled. And you will be surprised as what kinds of powers you have been carrying within you. Intuition can give you answers for ultimate questions – not verbally but existentially. Instinct and intuition are both independent of you. Instinct is in the power of nature, of unconscious nature, and intuition is in the hands of super-conscious universe. That consciousness surrounds the whole universe, is the oceanic consciousness of which we are jus small islands – or better, icebergs, because we can melt into it and become one with it. Intuition leads you only to yourself. It has no dependence, no need for the other, hence its beauty, its freedom and independence. Intuition is an exalted state needing nothing. It is so full of itself that there is no space for anything else. Meditation starts by being separate from the mind. If you are watching the flowers, one thing is certain: You are not the flower, you are the watcher. Watching is the key of meditation: Watch your mind. Don’t do anything, no repetition of mantra, no repetition of the name of god — just watch whatever the mind is doing. Don’t disturb it, don’t prevent it, don’t repress it; don’t do anything at all on your part. You just be a watcher, and the miracle of watching is meditation. As you watch, slowly mind becomes empty of thoughts; but you are not falling asleep, you are becoming more alert, more aware. As the mind becomes completely empty, your whole energy becomes aflame of awakening. This flame is the result of meditation. So you can say meditation is another name of watching, witnessing, observing, without any judgment, without any evaluation. Just by watching, you immediately get out of the mind. If you want to understand exactly what meditation is, Gautam Buddha is the first man to come to its right, exact definition that is witnessing. Love never hurts anybody. And if you feel you have been hurt by love, it is something else in you, not your loving quality, that feels hurt. Love as people ordinarily use the word is not love; it is lust. And lust is bound to cause hurt, because to desire somebody as an object is to offend that person. It is an insult, it is violent. Love is respecting the other as an end unto himself or herself. When you love someone as an end unto himself, then there is no feeling of hurt; you become enriched through it. Love makes everybody rich. Love can only be true if there is no ego hiding behind it; otherwise love becomes only an ego trip. Not that one can reach without seeking. Seeking is needed, but then comes a point when seeking has to be dropped. The boat is needed to cross the river but then comes a moment when you have to get out of the boat and forget all about it and leave it behind. Effort is needed, without effort nothing is possible. And also only with effort, nothing is possible. A moment comes when you see the whole futility of effort. You have done all that you can do and nothing is happening. You have done all that is humanly possible. Then what else can you do? In sheer helplessness one drops all search. And the day the search stopped, the day I was not seeking for something, the day I was not expecting something to happen, it started happening. A new energy arose – out of nowhere. It was not coming from any source. It was coming from nowhere and everywhere. It was in the trees and in the rocks and the sky and the sun and the air – it was everywhere. And I was seeking so hard, and I was thinking it is very far away. And it was so near and so close. Just because I was seeking I had become incapable of seeing the near. Seeking is always for the far, seeking is always for the distant – and it was not distant. I had become far-sighted, I had lost the near-sightedness. The eyes had become focused on the far away, the horizon, and they had lost the quality to see that which is just close, surrounding you. When you love someone, two are needed: I and thou. Without two, how can love be possible? If you are alone, how can you relate, how can you love? If you are alone, there can be no love, love is possible only when there is two; this is the base. But if they remain two, love is again impossible. If they continue to be two, then again love is impossible. Two are needed for love to exist, and then there is a second need that the two must merge and become one. This is the paradox. ‘I’ and ‘thou’ is a basic requirement for love to exist, but this is only the base. Love arises when these two merge into one. And the mystery is that somehow you remain two, and somehow you become one. This is illogical. Two lovers are two, and still one. They have found a bridge somewhere ‘I’ disappears, ‘thou’ disappears; where a unity is formed, a harmony comes into being. Two are needed to create that harmony, but two are needed to dissolve into it. It is just like this. A river flows; two banks are needed. A river cannot flow with only one bank. It is impossible; the river cannot exist. Two banks are needed for the river to flow. But if you look a little deeper, those two banks are joined together just below the river. If they are not joined, then also the river cannot exist; it will simply drop into the abyss. Two banks, apparently two on the surface, are one deep down. The rebel does not believe in anything except his own experience. His truth is his only truth; no prophet, no messiah, no savior, no holy scripture, no ancient tradition can give him his truth. The rebel is not an egoist. The egoist also does not want to belong to any belief system. He does not want to belong because he thinks too much of himself. He is too much of an egoist; he can only stand alone. The rebel is not an egoist; he is utterly innocent. His non-believing is not an arrogant attitude but a humble approach. He is simply saying, unless I find my own truth, all borrowed truths are burdening me; they are not going to unburden me. The rebel does not belong to any organization. He wants to remain pure and unpolluted so that he can search without any prejudice, so that he can remain open without any preconceived idea. But this whole approach is that of a humble person. A rebel respects his own independence and also respects the independence of everybody else. Source - Living on Your Own Terms: What Is Real Rebellion? By Osho page 1 – 2. Rebellion is individual action; it has nothing to do with the crowd. Rebellion has nothing to do with politics, power, violence. Rebellion has something to do with changing your consciousness, your silence, your being. It is a spiritual metamorphosis. And each individual passing through a rebellion is not fighting with anybody else, but is fighting only with his own darkness. Swords are not needed, bombs are not needed; what is needed is more alertness, more meditativeness, more love, more prayerfulness, more gratitude. Surrounded by all these qualities you are born anew. Rebellion is a very silent phenomenon that will go on spreading without making any noise and without even leaving any footprints behind. It will move from heart to heart in deep silences, and the day it has reached to millions of people without any bloodshed, just the understanding of those millions of people will change our old primitive animalistic ways.